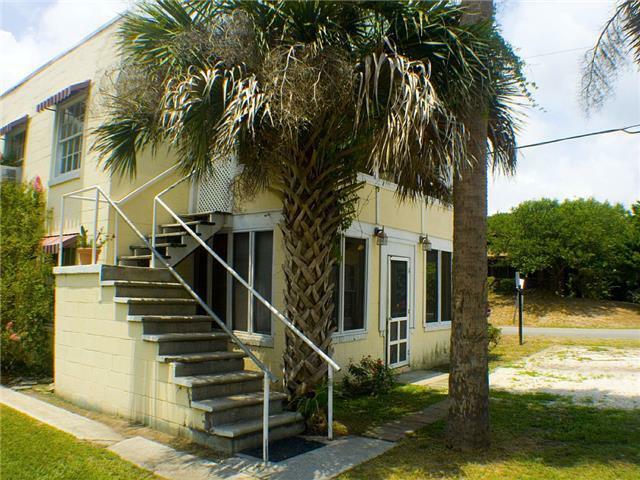 Cool Pet and Budget Friendly rental only a half a block to the beach and 1 block from Center street so you are walking distance to all the shops, restaurants, fishing pier and bars. Awesome, 50's style beach cottage duplex located in the heart of everything and ground level if stairs are a concern. This is a downstairs unit of a duplex so understand that you might have people staying in the separate unit upstairs. 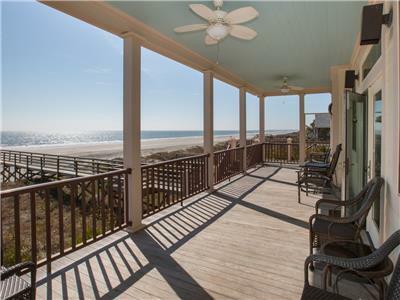 This 2 Bedroom 1 Bath is 1 block from all the restaurants and bars on center street and 1/2 block from the beach! Perfect for last minute & budget vacation plans. WiFi, Cable, Central AC and washer and dryer. The bed layout is 1 queen bed and 2 twins. 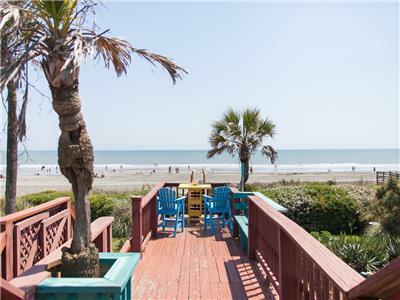 You are directly across the street from Loggerheads restaurant and bar which provides live music almost every day from their upper deck so sit on your screened in porch and listen for free!!! Need to escape? Head back into the bedrooms and the nightlife sounds are barely noticeable. Off street parking for 2 vehicles. Sleeps 4 in beds and 1 on couch. Upstairs unit also available for rent. PETS: This home is Pet “Friendly." Please help us keep it that way by not allowing your pets on the beds or furniture. There is a non-refundable $75 pet fee. You have to check the box for pets (it is located in the section with number of guests). 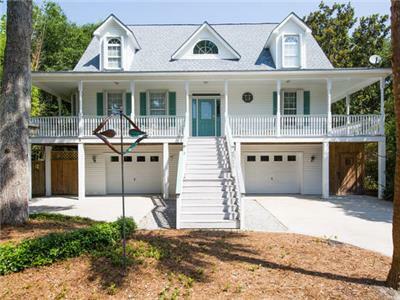 This has accents of the classic beach house which we liked and appreciated! The location was perfect! Bedding was comfy and we loved the screened in porch! Super clean and very quiet inside- a minute walk from the beach. Carla was so awesome helping with anything I needed. Great company and will definitely rent again!! Love being able to take my pups with me! Plenty of towels was a big bonus!!! Had the best time at Rogers Folly and Kira from Folly Rentals was great to work with! Would rent from her and this company again 100%!! SUPER impressed with this house when we arrived!!! Honestly, I was a little skeptical when booking. I gave up a fairly new rental for this one. I booked this older rental as opposed to the newer rental because of the location. I'M SO GLAD I DID!!! The location was perfect including very short walks to the beach, restaurants, bars, shopping, and the pier. Loggerheads Grill and Bar is directly across the street. There were live bands every night that we enjoyed listening to directly from the privacy of the screened in porch of the house. The noise was never a problem and couldn't be heard from inside the house. Loved having the washer and dryer. Beds were very comfortable and accommodated our entire family. The couches were even comfortable to sleep on. One huge perk: the tile floors through out entire house. Very easy sand clean up. Kitchen very well equipped with all of our cooking needs. Bathroom was a little narrow but was very manageable. I have and would recommend this rental to other friends and family and will stay again if my family rental is not available. =) The only very minor suggestion we all agreed upon that the house was missing would be to have some type of rug on the inside front door to wipe feet on when entering the foyer. Even though there was a small rug outside the door, it didn't catch much of the sand and wet feet when walking in. But as mentioned above, it was very easy clean up due to the tile flooring.